Do you share our vision for a region with safe opportunities to bike, walk and take public transit? Are you excited about the work that Active Trans does and have an interest in advancing our mission by educating others? If you answered yes, we need you to help us fight for this vision by becoming an Active Trans Ambassador. Click here to sign up for an evening training in our office, 6-7:30 p.m. on August 2. The Active Trans Ambassador program is a new initiative for volunteer leaders focused on promoting Active Trans’ city and suburban advocacy initiatives. Ambassadors represent us at events, highlighting our advocacy campaigns, building grassroots support for legislative priorities, and building our membership base. The Active Trans campaigns and initiatives we’ll cover on Aug. 2 include: Bike Walk Every Town, Chicago Leadership Network, Chicago River Trail, Trail Connect Chicagoland, Back on the Bus, and Lake Calumet. By the end of the training, you’ll be well versed in our mission and advocacy efforts. Volunteers who go through our training will be given a special, limited edition Active Trans Ambassador t-shirt. Ambassadors commit to representing us at a minimum of two events each year. We’ll provide opportunities during the year; there’s flexibility for you to identify events in your community and help us grow the movement by reaching new audiences. It’s a great way to support Active Trans, stay informed about our latest initiatives, and work for better walking, biking and public transit systems in our communities. 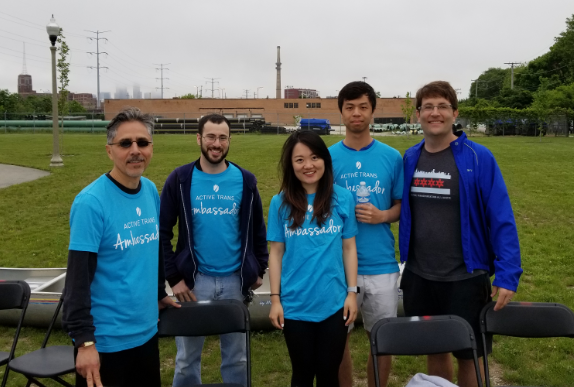 Thank you to our Ambassadors who’ve shared our message at events this summer like MB Bike the Drive, South Branch PAC’s Summer Party (pictured), Hero In Me Ride, Calumet Connect, Tour de Fat, and Lakefront Trail Celebration. Questions? Please contact Steve Simmons, steve@activetrans.org.